Now the skylight, once wasted in the laundry room, can be enjoyed in the shower. The white 6” by 24” tiles, similar but slightly larger than the original tiles, were laid horizontally to reinforce the horizontal character of the space. 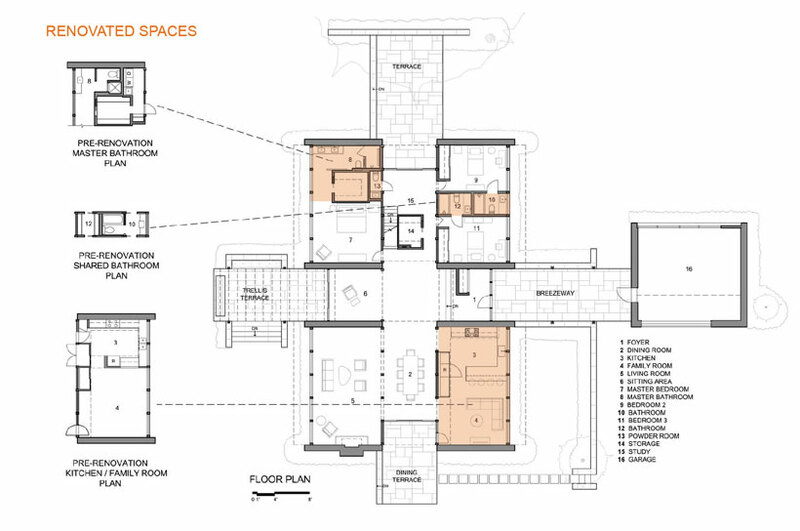 Working within the structure of existing beams in the shared bathroom, the team created two full bathrooms which increased property value and, more importantly, made the owner’s two children very happy. Thanks to the open floor plan, the polished aluminum chandelier above the dining room table is visible from the living room, where blackened steel accents the fireplace. 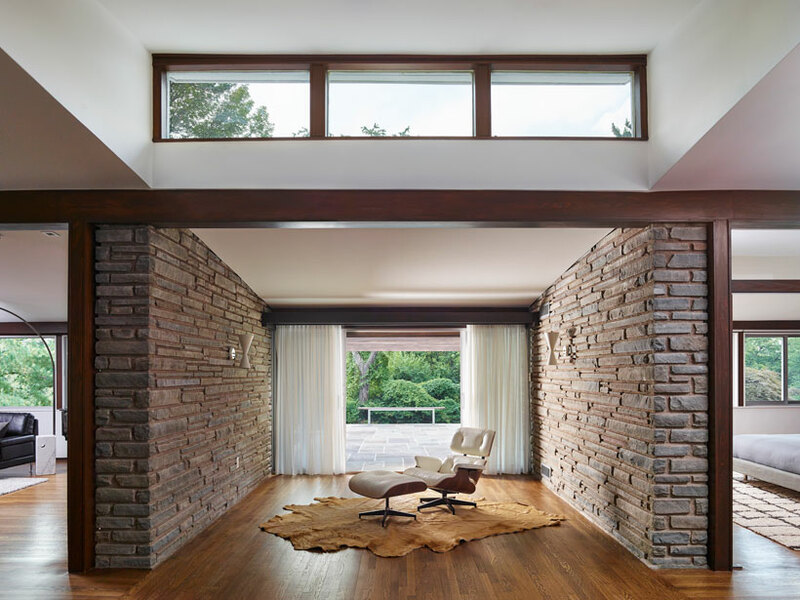 A clerestory window, replaced due to water damage, allows light to shine into the house. 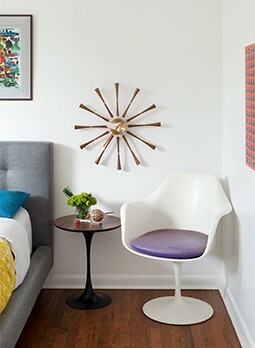 The white Eames chair is accented by the original white sconce. The wood burning fireplace in the living room was refurbished and in the process slightly updated. The original metal above the fireplace was angled out and had become rusted and damaged from years of use. Reinterpreted for a more modern look, a gas insert helps to create a minimalist feel while the metal hood above was done in blackened steel that shows the natural patina. The stacked stone landscape wall helps to define outdoor spaces and creates somewhat of an outdoor room. Originally designed without rain gutters, water was getting into the home’s basement and crawl space during substantial rains. Simply adding gutters to the house’s deep roof overhang would have spoiled the home’s clean-lined look, so the team devised an underground drainage gutter. A narrow band of river rock was added to the original splash blocks along the foundation—masking the drainage pipes. Similar to gutters and downspouts yet underground, this creative solution directs water away from the house while maintaining the original architectural integrity. Kevin and the homeowners were lucky—when they went to look at the home, the current owners were there, and they had all the existing drawings and documents from when the house was built. They could then make informed renovation decisions. Where Do You Want to Concentrate your Budget? “We approached it holistically as we would any project, trying to identify from the beginning what the potential costs were for the project and working within a budget,” Kevin advises. The goal was “to do it right and do it well,” Kevin continues. 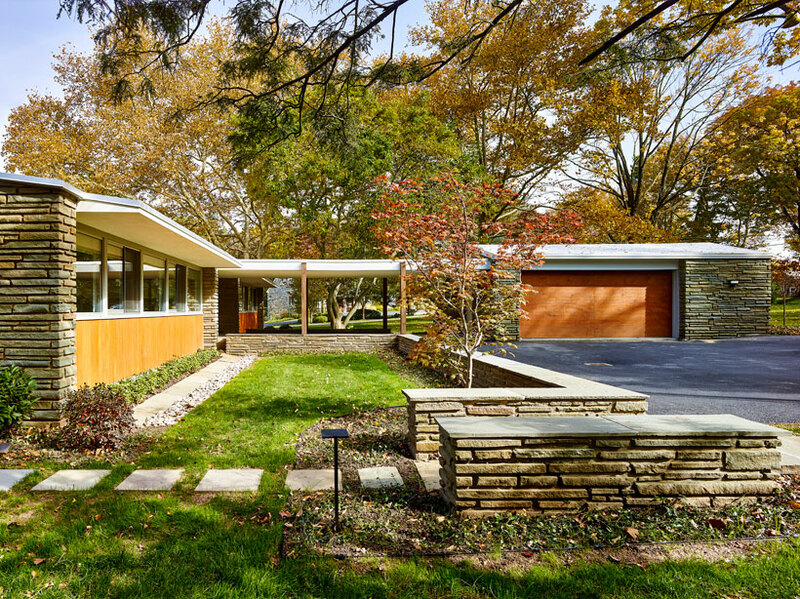 The homeowner, team, and consultants worked together to respect the architecture and the original design even if it wasn’t the least expensive option. These decisions not only maintained the original integrity but were also investments that added property value. While exterior stone was generally still in good shape, the mortar needed to be replaced so a specialist came in to assist with repointing and repair. For a seamless blending of old and new, the masonry conservation expert helped to match the original grout formula. 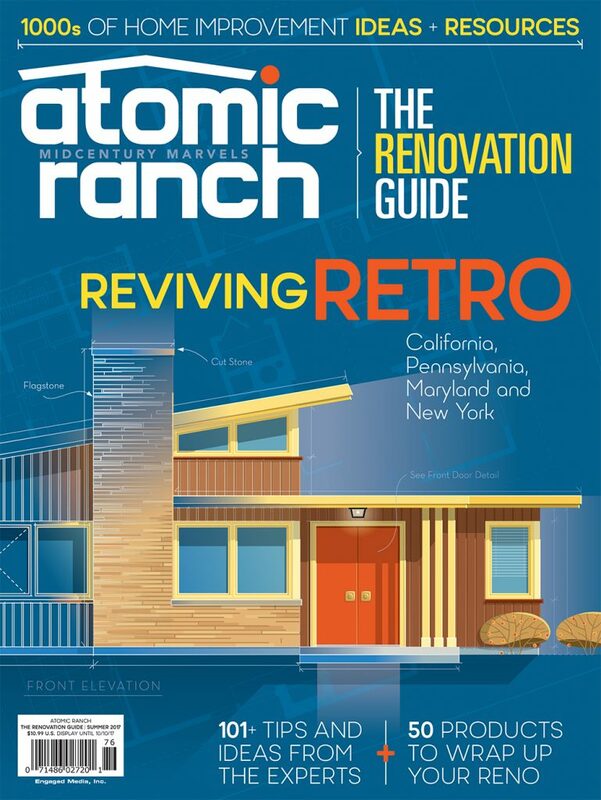 Because the original aluminum windows and sliding doors were not insulated and showing wear, they were all replaced by replicas sourced from the original manufacturer and put back into the exact same configuration. A faux redwood finish had been painted on the exterior wood from a prior update. After stripping off the paint and re-staining, the natural wood color was restored.